Welcome dear friends! Thanks for stopping by and visiting NatashaInOz.com! Like many people at the moment I am so excited because Christmas is coming! Yesterday we put up our tree and we have put out quite a few decorations also. And here is the lounge are with our decorated tree! While I am still decorating and moving things around, I thought I would share some holiday pictures in the form of a mosaic from our family album. As I have said, this is my first mosaic post so it is pretty simple! 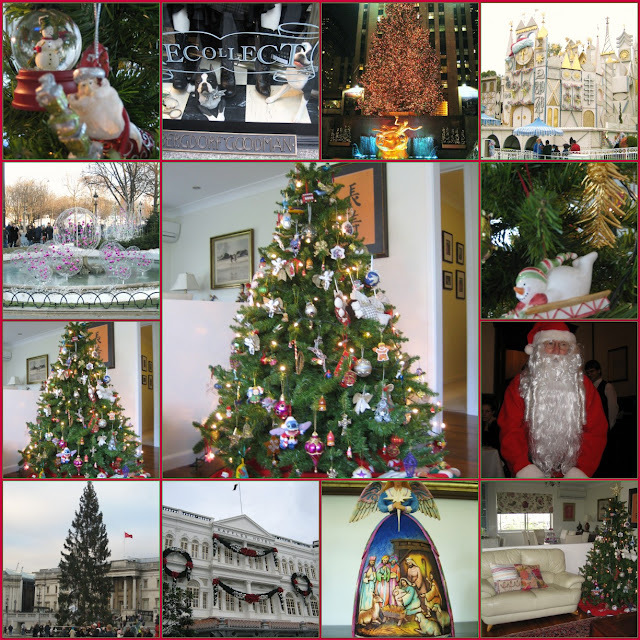 I have included some pictures from our trip to Europe and Singapore last year, our trip to America a couple of years ago and a few images from the decorations I put up yesterday. The picture of Father Christmas in his fine RED gear was taken in London last year on Christmas day. Doing this post has really got me in the mood for putting on some Carols, exploring other people's amazing blogs and starting to look for some new Holiday recipes! Thanks so much to the people who have signed up to follow my blog. I really appreciate your support and your very kind words. Today I am participating in Metamorphosis Monday which is a weekly party kindly hosted by Susan from one of my very favorite blogs "Between Naps on the Porch". Since I have been experimenting with the art of photo mosaics I will be posting my Holiday metamorphosis as a Mosaic and so I will be linking up with Mary from "The Little Red House" who is kindly hosting Mosaic Monday. I am also linking up with Mary's Ruby Tuesday over at Work of the Poet because I have a few splashes of Holiday RED thrown in! Thank you so much Susan, Mary and "The Teach" for giving me the opportunity to post with you! PS Has anyone seen this yet? We are going to see it on the weekend! Great mosaic, mixing the flowers with the flowered china. Beautiful. Wow! You have decorated for Christmas already! I'm still in autumn mode ...I always wait till after Thanksgiving to begin to think about Christmas, and because I buy a live tree I wait until the week before to decorate. I imagine that being early like this gives you a lot of time to get things done ... enjoy it all and Happy Mosaic Monday! Hi Pat! I always get our tree up around this time of year but if I was living in America you can be sure our house would be covered in Fall decorations and I would be getting ready for Thanksgiving! We tried a live tree here one Christmas too but with the heat of Summer it died within a week! Thank you so much for stopping by-hope to see you here again soon. Wow you sure are getting into the spirit! I"m not quiet there yet, but after our yearly trip to Disneyland the week after Thanksgiving... I will totally be onboard! DIsneyland always gets us into the spirit of the holidaze! Everything looks so pretty at your house and I love that mosaic! I cant believe you have your tree up already!! I havent even gotten a box out of the attic! and its hard for it to be 76 outside and there be a christmas tree inside haha.... sooo very soon though! Wow, 47 days. I am so unprepared! Your tree looks great. Can't wait to see what you do next. Grat job on your first mosaic. Thanks for sharing. I am putting my tree up just before Thanksgiving this year because we are going away for the weekend which is when we usually decorate. I am getting excited! Wonderful decorations and you are an early bird. I have not even thought of decorating the tree. Lovely mosaic. Hi Natasha, Our X'mas tree is up already too ! : ) .... I bought a new lavender cashmere tree from Michaels today...and had no patience till I set it up. In my opinion the minute the radio starts playing x'mas tunes...then its time to get out the jingle bells ! Your tree is LOVELY !